As a father of two children, Travis knows the importance of protecting his family. This is a major reason why he is so passionate about supplemental insurance and is proud to be part owner of the company. Travis is proud to share the story about his past because he hopes to raise awareness about the value of supplemental insurance and help people understand that unexpected events can happen anywhere and any time, not just on the battlefield. On April 10, 2012, Travis was critically injured while on a routine patrol during his third tour of duty in Afghanistan when an IED (improvised explosive device) detonated under him. Travis lost portions of both legs and both arms, but thanks to his amazing strength, courage, and incredible will to live, plus the heroic actions of the men in his unit and the health care providers at the Walter Reed Army Medical Center near Washington D.C., Travis continues to overcome life’s challenges, breaking physical barriers and defying odds. He is one of only five quadruple amputees from the wars in Iraq and Afghanistan to survive his injuries. 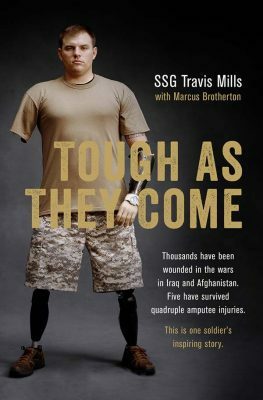 Travis wrote the New York Times bestselling memoir Tough as They Come, and his story has been featured on local and national news, including Fox News’ Happening Now with Jenna Lee and Ellen with Ellen DeGeneres. CBU Benefits and Travis Mills are dedicated to connecting with the millions of hardworking families that are unaware of the benefits of supplemental insurance to ensure they have financial protection from life’s unexpected events. Travis is proud to work with CBU Benefits to share his story and share the importance of supplemental insurance. If your company would like to learn more about supplemental insurance with a presentation from Travis Mills, you can request a presentation today. We look at Supplemental as a way to deepen long term relationships.